You could go to/depart from Pudong Airport by the Subway Line 2 (Identification Color: light green). 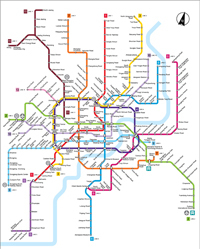 The Subway Line 2 go through the main subway station: Xujing East, Hongqiao Railway Station, Hongqiao Airport Terminal 2, Nanjing West Road, People's Square, Nanjing East Road, Lujiazui, Century Avenue, Longyang Road, Guanglan Road, Pudong Airport. Special Notes: The east extention part (Guanglan Road - Pudong Airport) is running separately from the other part. There only have 4-car metro train, the other have 8-car metro train. Passengers should change the train at Guanglan Road Station. But it's very easy, you could only get off, and go to your opposite on the same platform to waiting the coming train. Ticket price between two ends costs CNY 9, and costs CNY 3-8 for the rest. It costs CNY 8 between Pudong Airport and Hongqiao Airport.